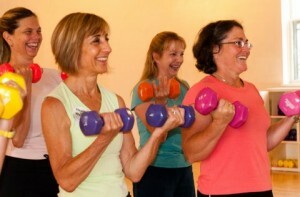 Have fun while you strength train! 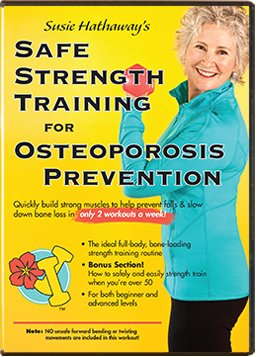 Exercise for osteoporosis: we not only want to feel good, we want to look good, too! Thanks, great question, Alyssa, and the "batwings" is one that I get a lot! It reminds me of a question I saw in the Rocky Mtn. News in the 80s that has had me laughing ever since. 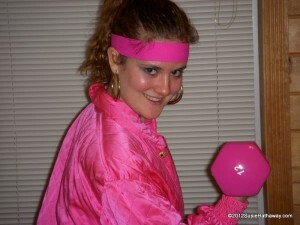 Workout attire for the 80s! But in answer to your question, YES! With consistent, progressive resistance (strength) training you can achieve a very, very strong, toned body. If you stick with it, you'll begin to see muscle definition that you never had before, even when you were young. You will LOVE the increased strength which often starts to become apparent by the third week of training. 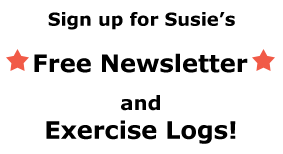 Just how tight everything gets depends a lot on genetics, skin tone, age, and body composition (fat to lean body mass ratio). The point is to strengthen your muscles, building a nice solid base underneath your skin. It does make a significant visible difference. But, honestly? We need to work with what we can control, exercise and a healthy diet, and let go of the unrealistic expectation that gravity and years won’t have an effect on our skin. Our bodies work and they're beautiful! Consistently staying active is the key. Research shows that inactivity and a sedentary lifestyle have more to do with loss of muscle and bone strength than aging. Moving is a big deal for health and quality of life! 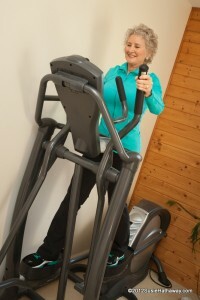 Ellipticals are fabulous for cardiovascular endurance. Anytime that you’re on your feet in a weight-bearing stance, it’s a reminder to your skeleton to stay strong. Every little bit helps. (Stand up a lot throughout your day.) Any kind of muscle activity always pulls on bones since all skeletal muscles are attached to bones. An elliptical workout is weight-bearing exercise, which is fairly good for bones, but it doesn't have the added impact of brisk walking. Pulling back and forth on those arm levers gives you a nice upper body workout, but it’s not as hard as good strength training. Even walking doesn't build bone. It can help maintain bone and slow down bone loss. In contrast, strength training gives a much, much bigger pull on bones which is why it can help to strengthen bones. Good luck with your workout! Let me know how it goes! 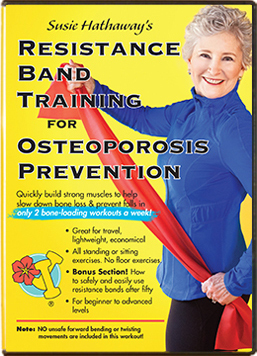 ← Osteoporosis Exercise Guidelines and Motivating Resources for New Year’s Resolutions! I think if you set the elipitical machine to higher resistance, you ARE getting strength training, which is what I do. Isn’t this true? If you don’t even set the machine to any resistance or higher angle (as I also do, and I notice many others don’t do this), you probably are right about it not being great for bone building. Yes, your elliptical will be giving you a good cardiovascular workout and some moderate muscle strengthening of the legs at that higher level. But you’ll be using more endurance/slow-twitch muscle fibers if you can keep it up for more than a minute. Muscle strengthening exercise, or strength training, challenges fast-twitch muscle cells which give the most power and strength. To be considered muscle strengthening, the exercise can’t be maintained for more than around 10-12 repetitions or around one minute. With that said, there is some cross-over with some of both cells working with the elliptical or any cardio machine and it’s why they’re moderately muscle strengthening. An example of the difference between training hard aerobically and strength training is how ice skaters can do quadruple jumps these days, but couldn’t decades ago. The reason is that they have added strength training for the power and strength needed to perform at these higher levels. It sounds like you’re getting a good workout on your elliptical. But if you also do some strength moves a couple of times a week on non-consecutive days, like squats, lunges, or weighted leg lifts, you’ll have stronger, more powerful muscles to get a better, more effective elliptical workout. With consistent strength training, only a few minutes a week, you’ll be pleased with the results.